Carefully open one end of each cookie box. Remove the cookies and the white paper trays from both boxes. Place the boxes back-to-back with the open ends up and tape the boxes together. Draw a line horizontally across the front of each box 5 1/2 inches from the bottom. Using scissors, cut down at each outside corner to meet the line. Bend the front of each box in at the line, at an angle, and tape to hold. Trim the sides at an angle so the boxes resemble a milk carton with an enlongated top. Cover the house with heavy-duty aluminum foil and tape to hold. Flatten the white paper trays. Tape the long sides of the flattened trays together, overlapping by about 2 inches, to make a large rectangle. Trim the rectangle to 11x6-inches. This will be the roof of the house. Fold the paper rectangle in half crosswise to create a crease at the center. Cover with heavy-duty aluminum foil. 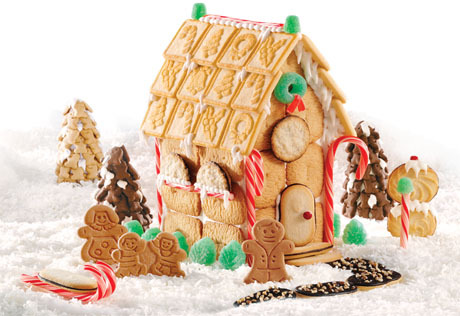 Do not attach the roof until after the house is covered with cookies. Beat the confectioners' sugar, meringue powder and water in a large bowl with an electric mixer on medium-high speed for 3 minutes or until the mixture is thick and creamy. Spoon the icing into an airtight container. Keep covered when not in use. Set the house on a large rimmed baking sheet. Spread a layer of icing on one side of the house. Press 6 Bordeaux cookies into the icing, arranging horizontally in 2 rows of 3 cookies each. Let dry for 30 minutes. Repeat with the other side of the house. Spread a layer of icing on the front of the house. Press 6 Bordeaux cookies into the icing, arranging vertically in 3 rows of 2 cookies each. You may need to trim an additional cookie to fit if there is a gap at the very top. Let dry for 30 minutes. Repeat with the back of the house. Let dry for 2 hours. Using icing as glue attach the roof to the house. Pipe icing across the bottom of one side of the roof. Press 4 Chessmen cookies into the icing. Repeat with 2 more rows of icing and cookies, with each row slightly overlapping the one below to resemble shingles. Repeat with the opposite side of the roof. Let dry for 2 hours. Using icing as glue, attach Milano steps and doors and Brussels windows to the house and decorate with the candies. Use leftover icing to make icicles. Sprinkle the baking sheet with coconut snow. Add a path to the door using Geneva cookies. Arrange the Ginger Family cookies in the snow. Recipe Note: To make the trees, lightpost and sled, you will need about 2 cups additional icing. Use 1 package (16 ounces) confectioners' sugar, 3 tablespoons meringue powder and 6 tablespoons warm water, and proceed as directed in Step 6. Goldfish Trees: Use 1 1/2 cups icing and 1 package (6.6 ounces) Pepperidge Farm® Goldfish Grahams, any variety. Spread a thick layer of icing on 4 sugar ice cream cones. Press the goldfish, tails down, into the icing in a single row around the wide end of each cone. Repeat until the cones are covered, with each row slightly overlapping the one below. Let dry for 1 hour. Milano Sleigh: Use 1 tablespoon icing, 2 candy canes and 1 Pepperidge Farm® Milano Cookie. Carefully trim the ends of the candy canes to 2 inches longer than the cookie. Using icing as "glue", attach the candy canes to the bottom of the cookie. Let dry for 1 hour. Candy Cane Light Post: Use 2 tablespoons icing, 1 Pepperidge Farm® Chessmen® Cookie, 1 white spice ring, 1 green spice drop and 1 piece (3 inches long) candy cane. Use icing to attach the spice ring to the cookie. Place the candy cane upright in center of spice ring and "glue" with more icing. Let dry for 1 hour. Attach the green spice drop to top of candy cane with icing. Lido Cookie Tree: Use 2 tablespoons icing, 2 Pepperidge Farm® Lido® Cookies and 1 ChessmanTM Cookie and 1 red mini candy coated plain chocolate candy. Trim 1/4-inch from two opposite sides of one Lido cookie. Trim 1/4-inch from one side of the second Lido cookie. Glue 2 trimmed sides of the cookies together with icing. Let dry for 1 hour. Lay the Chessman cookie flat. Pipe icing onto the Chessman cookie. Press the Lido cookie tree into the icing upright with the remaining flat side down. Pipe additional icing on the top of the tree and decorate with the candy.